Thursday’s preliminary deal on Tehran's nuclear program comes after nearly 18 months of negotiations between Iran and the P5+1 group of countries, comprising the United States, France, China, Russia, the United Kingdom and Germany. BISHKEK (Sputnik) – Achieving the framework agreement on the Iranian nuclear program is encouraging, now the key components of the deal should be implemented, Russian Foreign Minister Sergei Lavrov said. As part of the deal, Iran will build no new enrichment facilities or heavy water reactors for 15 years, will limit its stockpile of enriched uranium and allow enhanced transparency procedures. The number of centrifuges operating in Iran will be cut by more than two-thirds in 10 years. 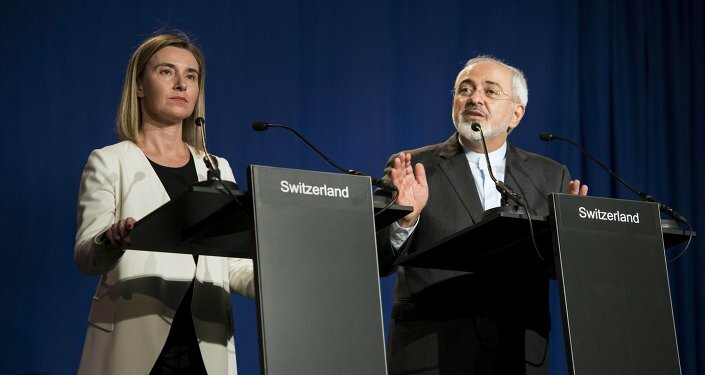 In return, US and EU nuclear-related sanctions imposed on Iran will be suspended after the International Atomic Energy Agency (IAEA) verifies that Tehran is following through with the key nuclear agreements. "The result [of the talks on Iran's nuclear program], the agreement itself is a political framework, which defines the main solutions to the most pressing problems: enrichment, the problem of research and development activities in the field of nuclear energy and issues that should be solved in terms of transparency to ensure full compliance with the IAEA control over all the accords. And, sanctions against Iran will be lifted in response," Lavrov told journalists in Kyrgyzstan’s capital of Bishkek. "All of this — the key ingredients that have yet to be translated to the language of practical action," the Russian foreign minister added. Experts are required to submit a detailed document on the implementation of the deal by Tehran as well as on the lifting of anti-Iranian sanctions, Lavrov said. Russian Foreign Minister Sergei Lavrov also said that Moscowconsidered the chances of reaching a final agreement on Iran’s nuclear program as being very good after an interim agreement had been hammered out by the P5+1 group and Iran in Lausanne, Switzerland. The deadline for reaching a comprehensive agreement has been set for June 30, 2015.